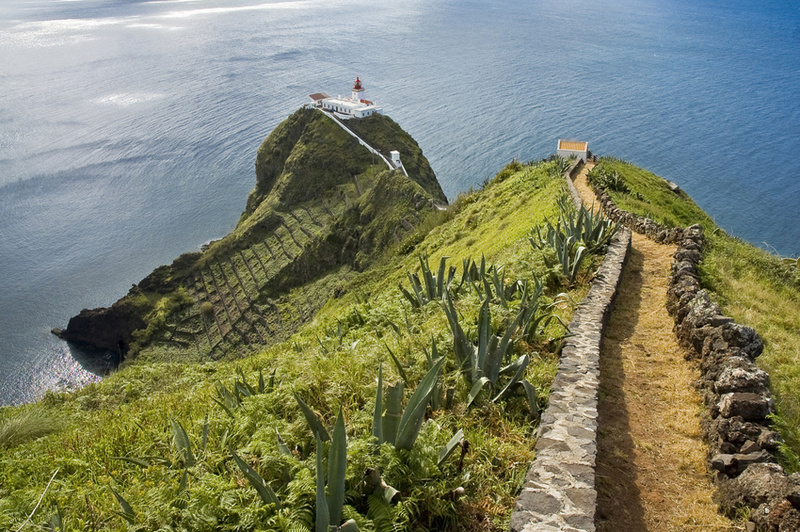 Santa Maria is a small island only 17km long and 9km wide, the highest point of the island is Pico Alto. Santa Maria was discovered in the early 15th century, with settlers coming over to populate the island from Portugal after 1439. The island was attacked by pirates many times and the inhabitants used to hide in caves to escape the pirates taking them as slaves. The textile industry and in particular dye supported the local economy, agriculture and fishing now plays a major role. Santa Maria is the oldest island in the Azores and has many amazing geological formations to see and many fossils have been found on the island. Ribeira de Maloas is a formation of vertical columns where the lava flow met the sea and has created an unusual cliff with a waterfall. The Barreiro da Faneca, known as the “Red Desert”, with its clay rippling landscape is like something you’d expect from the surface of mars! Nossa Senhora dos Anjos Chapel is the chapel where Christopher Columbus prayed when he visited the island in the late 15th century after his journey to America. This is considered to be the first church on the island and therefore one of the oldest buildings. Picturesque hillsides abound in Santa Maria and none more so than Baia de Sao Lourenco, where a natural amphitheatre surrounds the village on the coast. If you are looking for beautiful beaches then the white sand beach at Praia Formosa is just the ticket.